When Apple announced their iPhone 5S at the iPhone event last week, their flagship feature alongside the Touch ID fingerprint sensor was the fact it included the A7 Chip. Apple said this was the world’s first 64-bit ARM-based chip, consequently making the iPhone 5S the world’s first 64-bit device. 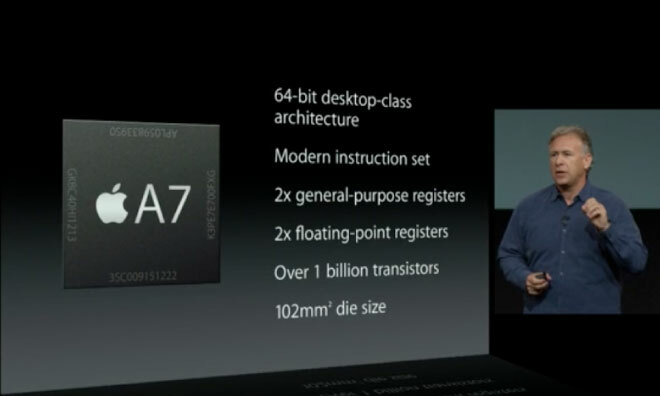 However, what they didn’t mention was that the A7 Chip and consequently the iPhone 5S isn’t actually quad-core. No, in fact it’s dual core and therefore sits in the same specification as all those 32-bit quad core Android handsets out there. The discovery comes as reviews start pouring in from sites getting their hands on the review units and running various benchmark tests to see just how fast this 64-bit iPhone 5S is. The thing is that the tools being used to count cores is only returning two. Whilst in Apple’s defense they never boasted the iPhone 5S was quad-core and made no claims of the like, it is a surprising move given the variety of Android handsets out there that boast quad-core configurations. However, despite this, it may not necessarily be a bad thing. The speed race, as reported by some analysts, was forced onto smartphones with them really not being a necessity. Consequently there’s other ways to come up with the ideal performance power for a phone. That seems exactly what Apple has done – retain the dual-core configuration to save on battery life, whilst expanding to 64-bit to utilise the performance improvements, especially for Apps that will be optimised for it. Benchmark tests are confirming Apple’s claims that the dual-core A7 is the fastest chip in a mobile device, so it seems the fact it’s not quad core really hasn’t affected it too much. What do you guys think? Is leaving out quad-core going to affect Apple in the long term? Comments below.